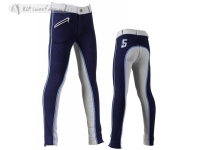 Lightweight childrens breeches for the warmer season. Stretch cotton jersey (95% cotton and 5% spandex), 280 gr, tight fitting with long self knee patches. Model 2014 with the new ankle inserts.